Our kindergarten resources will make your job of planning easier and give you more time to focus on what you love to do—teach! Reading is a key focus of kindergarten. Good reading skills are the foundation for all future learning. KidsSoup offers fun and age-appropriate literacy activities, folder games, and emergent readers to teach phonics, phonemic awareness, fluency, and vocabulary. Finger plays, rhymes, songs, and felt stories are another fun way to help your children to develop the vocabulary they will need as they begin to read. With our thematic kindergarten activities, children can explore math and science processes and concepts with fun hands-on activities, worksheets, and lessons. 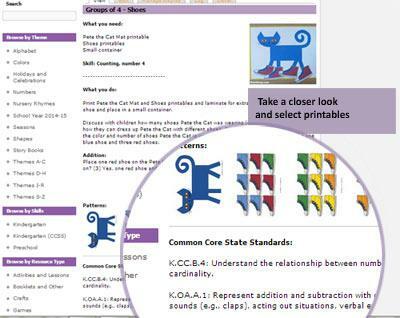 Our well-organized and aligned to the Kindergarten Common Core State Standards resources and lessons will enable you to build upon what your children already know and are able to do and will encourage them to learn new concepts and skills. The KidsSoup Resource Library offers thematic resources for more than 100 kindergarten themes. What makes us different is, that as a KidsSoup Resource Library member you will get access to our easy-to-navigate online library with all our over 9,000 preschool and kindergarten resources. Begin by choosing a theme or a skill you want to focus on and find the perfect kindergarten resource. You can search by theme, skill, Common Core State Standards, or resource type. Get activities and printables for your reading and math centers and more. Print the directions and printables you need right from your computer or save them in your own folders inside the My Resource Box for easy future access. No need to download large files to save on to your computer. All resources are always there right at your fingertips! Find out more and have a look inside our KidsSoup Resource Library. Our newest addition. As a Story Twiggles member you will get access to our Story Twiggles online library with our over 70 interactive emergent reader books (Twiggle Books), activities, and worksheets for each book. 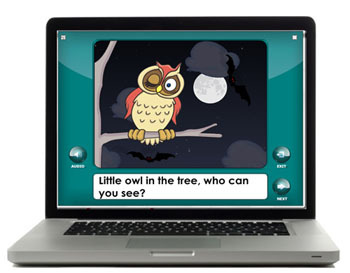 Our online interactive emergent reader books are divided into five reading levels based on a combination of factors including Flesh-Kincaid readability scores, predictable text, word count, word repetition, word structure, vocabulary, illustration, and sentence structure. Each Twiggle Book story comes with activities and printable worksheets to extend on the story. Our Twiggle Books can be projected up on the large screen or white boards and can be used for digital read-alouds projected to the whole class or small groups. There is also a Reading Room option where you can group and assign books to a set of children. The ABC Twiggles Program contains printables, interactive online booklets, and activities for each letter of the alphabet. All resources can be viewed right from your computer and are downloable and can be printed easily from anywhere. Included in the program are a lesson guide, lesson plans, assessments, and parent newsletters in English and Spanish.